Chestnuts are a popular nut for the holidays, but they can be quite expensive to buy. 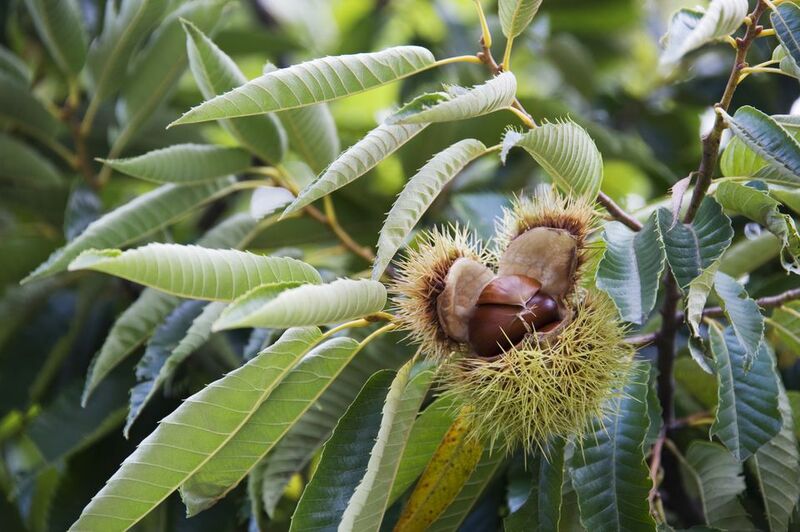 Locate a chestnut tree and harvest your own, so you can enjoy them for free. Here's what you need to know to get the job done. Chestnuts are the fruit of the Castanea species of trees, which are found throughout the world. The American chestnut has suffered from blight, and many of the native trees have been wiped out. So, chestnuts aren't as easy to find as they once were. But if you're willing to look around a bit, you should still be able to track down a chestnut tree. This deciduous tree is very easy to identify. Fully grown chestnuts usually reach a height of 50-75 feet tall and grow long, skinny leaves that are shaped like canoes. The leaves have pointed 'teeth' running along the edge, and are attached to the tree by a very short stem. But perhaps, the most telling characteristic of the chestnut is the spiny husks, called burrs (or burs), that grow in clusters on the tree. These protective burrs are where the chestnuts form. They typically appear on the tree in early summer and stay attached to the tree until late fall, when the nuts are ready to harvest. Do not confuse the horse chestnut for an edible chestnut tree. Horse chestnuts are poisonous. Horse chestnut trees have large leaves, consisting of five or more individual leaflets that share a single stem; and their husks are mostly smooth, with a small number of bumpy spines. You could easily pick a husk up without gloves. That's not the case with sweet chestnuts. Look at a picture of each, and you'll never confuse one for the other. They're very easy to tell apart, once you've seen a side-by-side comparison. Wait for the chestnuts to fall to the ground. Remove the nuts from the burrs. Discard any with wormholes or other signs of damage. Beat the squirrels: Try to gather the chestnuts as soon as they fall to the ground. It will preserve the quality of the nuts and minimize loss to squirrels (they love chestnuts, too). Look for open burrs: When the chestnut is mature, the burrs will open, and that's when you want to remove the husks. Leave the dark brown inner shell. Don't shell until needed: Chestnuts will dry out within a week of being removed from the shell. Keep them fresh by shelling them right before you're ready to use them. Store properly: In-shell chestnuts will keep in the refrigerator for a month or in the freezer for a year. Listen for the rattle: Chestnuts that are in the shell dry out and shrink as they age. Test the freshness of chestnuts by shaking them. If you hear rattling inside the shell, they may be too dry to eat. Sorting chestnuts: When sorting chestnuts, look for shells that are smooth, glossy and heavy. These will hold the tastiest nuts. Chestnuts are delicious and have a mild, semi-sweet flavor. When raw, they are crunchy and will soften when cooked. There are many ways to enjoy your harvested chestnuts. Roasting chestnuts is a very popular method and a favorite holiday treat. Chestnuts can also be boiled or braised. Chestnuts are a common ingredient in many recipes. They can be used in desserts, stuffings, soups and savory meat dishes. Candied chestnuts are delicious and a great way to reward yourself after the harvest! You can even make your own chestnut flour to use in bread. Pecans, walnuts and pine nuts are a few of the many nuts that you can harvest yourself. How to identify trees with edible nuts, so you can stock up on free nuts each fall.